Willmington's Bible Handbook gives a verse-by-verse commentary of each book of the Bible and is written with both new believers and seasoned students of the Bible in mind. This special Bible handbook also includes many special features that provide fresh, new insights into the most inspirational book ever written. "How We Got the Bible" explains how 40 authors over 2,000 years spoke the same saving message. "People to Remember" brings the stories of Bible people to life. Discover New Insights into the Greatest Book Ever Written! People to Remember: Stories, statistics, and spiritual lessons from the lives of more than one hundred people from the Bible. Bible Lists: Dozens of lists, including chronologies of Bible books and events, biblical covenants, facts about heaven and hell, Old Testament prophecies about Christ, Bible authors, and kings and emperors in the Bible. Bible Background and Study Helps: Articles on the nations, politics, and important cities of Bible times; the churches of the New Testament; how we got the Bible; archaeology and the Bible; Israel's calendar, Sabbaths, and much more. Packed full of exciting Bible facts and information, Willmington's Bible Handbook is a must for any student of the Scriptures! Your Complete Bible Resource in One Volume! Willmington's Bible Handbook contains a tremendous amount of reference material to help you study the Scriptures and gain new insight into the most fascinating and inspirational book of all time. Part 1 of this extensive Bible handbook contains informative book introductions and a verse-by-verse commentary on each book of the Bible. Part 2 contains a wealth of historical and theological information that illuminates the Scriptures and calls into focus the remarkable unity of the Bible. There is also a section devoted exclusively to the person and work of Jesus Christ. 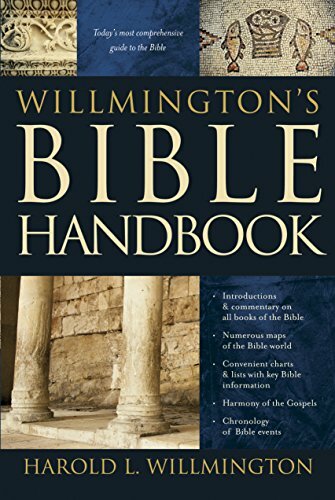 Whether you are a pastor, scholar, teacher, or new student of the Bible, you will find Willmington's Bible Handbook easy to use and immensely helpful in understanding God's written revelation to the world. Begin reading today, and embark on a fascinating journey through history to discover God and his redeeming work in the world he created.